It’s new scenery every step of the way with the only guide dedicated to loop hikes in New Hampshire and Maine. 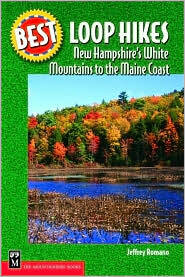 The book includes 60 hikes throughout New Hampshire and Maine, from easy half-day trips to extended journeys, many with options to shorten or lengthen the hike. Most hikes accessible from common vacation destinations, including Bar Harbor and Freeport in Maine, and Conway, Lincoln, and the Lakes Region in New Hampshire. Best Loop Hikes features a helpful "Trail Finder" chart listing hikes by features, difficulty, and more. The book captures hiking with a welcome twist: no tandem driving, no dropping off a car at the end of the trail—and no turning around to hike back the way you came. Research on the book included more than 450 miles of trails to select the best loops in northern New England—from the rolling hills of southern New Hampshire and towering summits of the White Mountains to the large lakes and abundant wildlife of the Northern Forest and rocky coastline of Maine.